This recipe is a combination of many I read in the past weekend. I had some yummy beef tips from Gahn Meat Company (they needed a photo, so I made a dish), I needed a recipe, and voila! Savory Beef Tips & Noodles was born. The meat, after simmering an hour and a half, comes out so tender and flaky while the sauce is layered with flavors of garlic (of course), red wine (ditto), and spices. Enjoy. Pairs better with Chianti than fava beans and liver, just saying. 1. Pour yourself a glass of red wine to drink whilst cooking. 2. Heat olive oil in deep skillet over medium heat and saute onion, garlic, and mushroom until onion is glossy, approximately 5-7 minutes. Meanwhile toss beef tips in large bowl with 2 tbsp. flour until evenly coated. 3. Add beef tips to skillet and sear meat on all sides, approximately 3-5 minutes per side. Add beef broth and red wine, reduce heat to low, cover, and simmer 1 hour. 4. In small bowl whisk together dry soup mix, 1 tbsp. flour, and water. Add to skillet, cover, and simmer additional 30 minutes. Cook egg noodles according to package directions. Serve tips on top of noodles with another glass of red wine on the side. 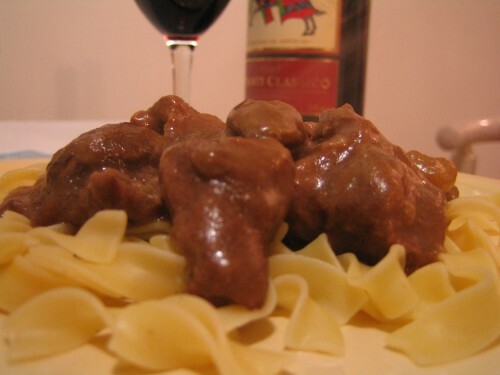 This entry was posted in Beef, Main Dishes and tagged beef, beef tips, Chianti, cooking with wine, Gahn Meat Company. Bookmark the permalink.